A fair portion of the country is covered in snow, and the idea of harvesting fresh-from-the-garden vegetables is but a shadow of a unicorn’s dream. Grove Labs wants to make that dream a year-round reality with its hydroponic garden. Blanchet and co-creator Jamie Byron met at MIT. Their aquaponic garden was the hit of their frat, and the roommates decided to prototype an indoor garden anyone could use to grow tomatoes, chard, peppers, herbs, and the official green of Portland, kale*. A couple years and $2 million in funding later, Grove is starting an early adopter program for their gardens in Boston. Just over six feet tall, the system is a cabinet with boxes. 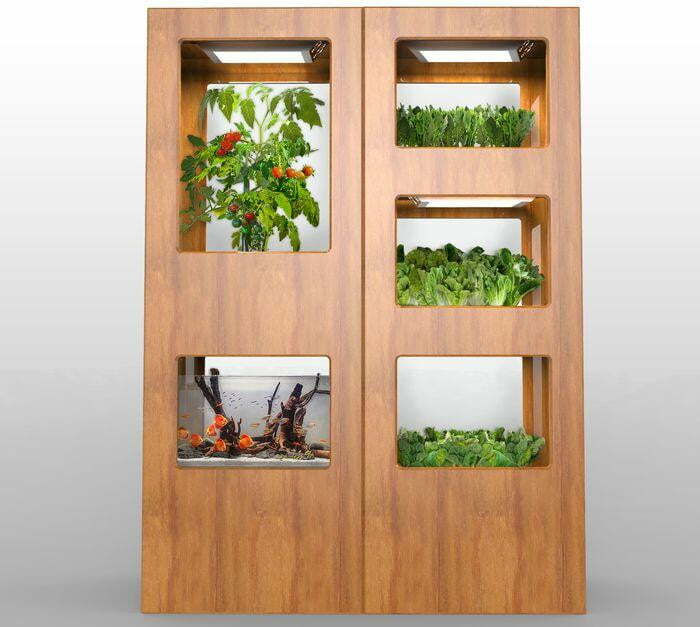 Four of them hold plants, with LED lights that connect to the Grove OS, allowing users to control the lighting schedule, as well as monitor the temperature, humidity, and water level. The fifth box is home to a fish aquarium, “the heart of your Grove.” Mimicking an ecosystem, bacteria feeds on fish waste (try not to think about), producing fertilizer for the plants, which in turn clean the fish’s water. Ah, the circle of life; it moves us all. A monthly subscription box, which is optional and costs $25 a month, provides early adopters with their seed varieties; no need to visit a garden store. Right now, only Boston residents are eligible for the program, though those outside the area who are eager to join can suggest a city for Grove’s next launch. Reserving a spot requires a $350 deposit, with pickup and delivery starting in February 2015. Because it’s in the prototype stage, the Grove team is really hoping for lots of feedback from early adopters. They ask users to interact with their Grove at least every other day and be willing to participate in interviews and surveys. Once the two-tower system is perfected, the Grove team expects it to cost over $2,400. That’s a substantial investment, and it comes with the responsibility to not even keep plants alive, but fish, too. In contrast, a recently launched Indiegogo for smart garden Plantui Plantation is offering an early bird rate of $250, though the expected retail price will rise to $730 later. Basically, it pays to get in early, when the cost of these systems is about half a year’s worth of home-delivered CSA produce boxes. Is Taylor Swift taking a stand against Spotify, or spouting propaganda for Google?